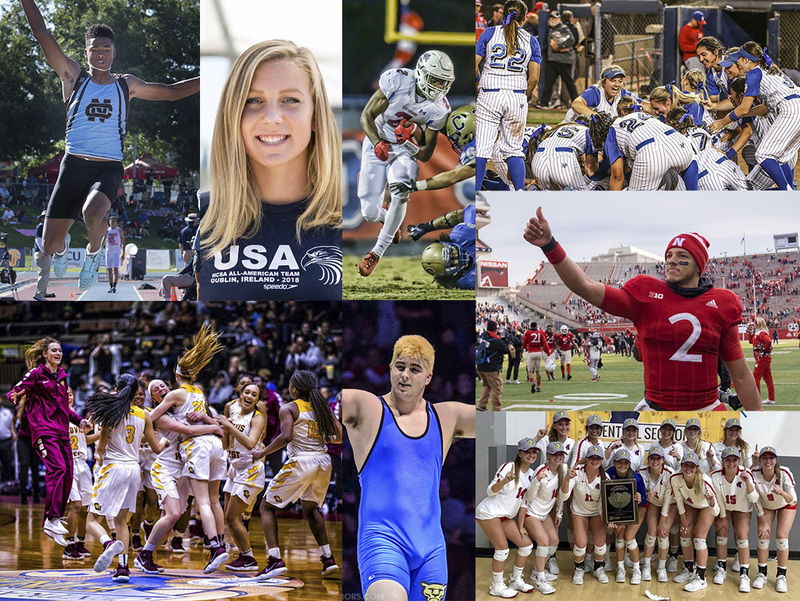 December signals the end of the 2018 calendar year in sports, and it was certainly one to remember in Clovis. It’s always fun to look back and reminisce at all the great accomplishments and stories, so let’s take a rewind at the special year it was. Granted, there are hundreds of fantastic tales to be told from all 23 boys and girls sports throughout the year, but here are eight storylines that caught my attention the most. And, before we turn the calendar and welcome in the New Year, I want to thank you, my trusty readers, for all your support this past year. See you in 2019! The Clovis North track and field program made its mark on the Central Section in 2018, dominating the TRAC championships, blasting the competition at the Central Section meet, then placing fifth at the 2018 CIF State Track and Field Championships. A well-balanced team in both track and field events, the Broncos’ most impressive performance at the state meet was by the 4×100 relay team of Christian Wood, Caleb Foster, Nathyn Scruggs and Kurt Kobzeff. The team broke its own school record with a time of 41.14, placing second to Great Oak’s 40.99. Foster, a sophomore at the time who also qualified in the 110 hurdles, placed fourth in the long jump followed by Wood’s sixth place. Jared Whitt finished third in the triple jump. Perhaps the most recruited football player the Central Section has ever seen, Milton has close to 40 Division I offers, including all the big boys of college football: Alabama, Ohio State, Georgia, Notre Dame, USC and yes, Fresno State, to name a few. He is rated a five-star running back by multiple publications and was named the 2018 TRAC Offensive Player of the Year in his junior year after rushing for 1,337 yards and 27 touchdowns. Milton has stated he will make his college decision in the summer of 2019. Years of frustration melted away for Buchanan when Kylie Kerney smashed a kill on the left side against Central in the Central Section title game, setting off a wild celebration as the Bears captured their first Valley title since 2007. Buchanan was denied a title last season when Central came back to beat the Bears in five, a crushing defeat they waited a year to avenge. They advanced through the first two rounds in the CIF Open NorCal championship bracket before losing to Central to finish the season with a 35-8 record and No. 8 state ranking. Martinez’s 2017-18 senior season at Clovis West certainly did not go as planned but that didn’t stop him from having a remarkable year. After suffering a shoulder injury during basketball season that required major surgery, Martinez missed his entire year on the football field. The four-star quarterback signed with Nebraska in December after newly-appointed coach Scott Frost took a red eye for a home visit. Martinez enrolled in college in January and was named the first true freshman starting quarterback in school history before the season opener. And what a season it was for Martinez, who doesn’t turn 19 until January. The Clovis Unified product threw for 2,617 yards, 17 touchdowns against eight interceptions, plus 629 rushing yards and eight more scores in 11 games for the 4-8 Huskers. In all, he broke 11 school records, including the following freshman records: passing yards (2,617), total offensive yards (3,246), passing touchdowns (17), and total touchdowns (25). He led all NCAA freshmen with 295.1 yards per game of total offense in addition to his seven 300-yard passing games. How valuable is Martinez to Husker football? “I wouldn’t trade him for anyone in the country,” Frost recently said. Even before officially swimming for Clovis North High School, 14-year-old swimming sensation Claire Tuggle has made a national and international splash. In 2018, she won three golds (400 free, 400 IM and the 200 IM) at the Speedo Junior National Championships at Irvine and participated in the Junior Pan Pac Games in Fiji this summer. She hold numerous NAGs (national age group) records and swam a 1:44.96 in the 200m free, the second fastest time ever in the 13-14 age group behind Missy Franklin’s 1:44.55 in 2010. She was named the 2018 Granite Ridge Girls Athlete of the Year and was featured in Sports Illustrated’s Future Stars of Sports issue. One of the most impressive streaks, in not only the Central Section but in the state, is the Clovis West girls swim team’s 22 straight Valley championships. The streak continued in 2018 when the Golden Eagles blew through the field with 476.5 points to runner-up Buchanan’s 315. Abby Samansky won the 100- and 200-yard freestyle crown in addition to joining Caitlyn Snyder, Lexie Voice and Jordan Gruce on the 200 free and 400 free relays. Girls basketball in Clovis Unified has never been better, and after a stellar and competitive 2017-18 season, 2018-19 promises to be even better. Case in point: Clovis West (11-1), Clovis (13-1), Clovis North (10-1) and Buchanan (10-2) add up to a combined record of 44-5 so far this season. Clovis West is currently ranked No. 3 and Clovis North No. 12 in the state by Cal-Hi Sports. The marquee team is obviously Clovis West, the program that won the 2017 CIF Open Division title with a No. 1 national ranking. In 2017-18, many believed the Golden Eagles were vulnerable, especially after graduating five Division I-bound seniors. But, lo and behold, the Golden Eagles proved tradition doesn’t graduate with their 13th straight TRAC title, a sixth straight Central Section championship, and a return trip to the CIF Open SoCal Championships where they fell 61-50 to eventual state champion Windward. They finished ranked No. 5 in the state by Cal-Hi Sports with a 32-4 record. Led by head coach Craig Campbell and his daughter, Maddie, a Cal-Hi Sports First Team Elite selection, they exceeded all expectations in 2018 with only one senior starter. In addition to Campbell (a USC signee), the team featured Champney Pulliam (University of Idaho signee) and Aari Sanders (Academy of Arts signee). Freshman point guard Nikki Tom also burst onto the scene, earning First Team All-State Freshman honors. Campbell is on pace to break the school career scoring mark this season. The Clovis softball team, a group loaded top to bottom with no apparent weakness, was on a mission this season. The Cougars finished 30-2 overall, 10-0 in TRAC play and won the 2018 CIF Central Section D-I title with a 6-3 win over Buchanan. They finished ranked No. 4 in the state by Cal-Hi Sports and No. 13 nationally by MaxPreps and USA Today. Coached by Mike Noel, they have won three of the last four Valley titles and the 2018 team is certainly in the conversation as one of the great Clovis softball teams of all time. Led by senior pitcher Danielle Lung (now at Fresno State) and her perfect 25-0 record, the best in Central Section history, the Cougars outscored league opponents 68-6 and 210-51 overall, breaking numerous school records in a season they posted the highest winning percentage in school history. Their only two losses were at the Whittier Christian Tournament, both games Lung did not pitch. They shattered the team home run record of 23 set in 2016, blasting 31, led by senior Emily Puente’s nine, followed by sophomore sister Allie and senior Jordyn Martinez’s seven each. Clovis High’s Seth Nevills cemented himself as one of the greatest California high school wrestlers of all time when he won his fourth straight CIF state heavyweight title in dominating fashion on March 3 when he pinned Vacaville’s Jake Levengood in 49 seconds. Only the third wrestler in history to win four state titles, Nevills finished with a 169-1 career record and 39-1 his senior year. All his wins his junior and senior seasons were by pin and he finished as the No. 2-ranked heavyweight in the nation by Intermat. He is attending Penn State on scholarship.